With an overflow in the amount of information that is readily available to us as readers due to the advancement of technology, it may be difficult to understand the facts that are presented to us as consumers of the news. 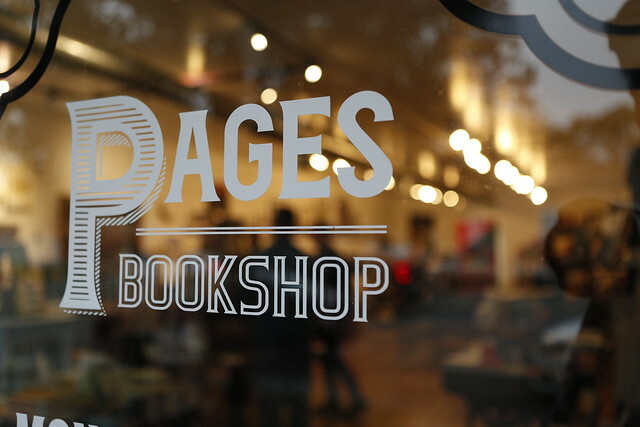 Pages Bookshop located in Detroit, Michigan, hosted an in-depth discussion about censorship, news literacy, and the importance of fact-checking with locally based writers and authors. Panel members for this conversation included Katrease Stafford, Anna Clark, and PEN Members Jack Cheng and Drew Philp. This panel was moderated by Jordan Works, a member of the Journalism Institute for Media Diversity at Wayne State University. When it comes to fraudulent news, you have an active role to play. After this evening, participants were able to take the steps necessary to understand how they can speak up for press freedom and learn to engage in productive dialogue. This event was made possible by PEN America’s Press Freedom Incentive Fund, which was designed to support activities that engage and stimulate press freedom advocacy. Find more information on the Press Freedom Incentive Fund here. Drew Philp’s work has been published both nationally and internationally and has appeared in publications including BuzzFeed, The Guardian, the Detroit Free Press, De Correspondent, the Metro Times, and The Michigan Daily. In 2017, Scribner published his first book of nonfiction, A $500 House in Detroit: Rebuilding an Abandoned House and an American City, for which he won the 2017 Stuart D. and Vernice M. Gross Award for Literature. His essays and profiles have appeared in books and collections in the United States and Europe. He is a 2016 11th Hour Food and Justice fellow at the University of California, Berkeley, under the direction of Michael Pollan, and a 2017 Kresge Artist Fellow. Katrease Stafford is an award-winning journalist and Detroit government reporter at the Detroit Free Press, Michigan’s largest newspaper. Her work often appears in other publications including USA Today, the Associated Press, and the Huffington Post, and she has appeared on television with Nancy Grace, Greta Van Susteren, and on other television shows. Stafford received several awards for her work, including the Society of Professional Journalists’ 2017 Young Journalist of the Year Award and the 2014 Rookie Writer Award from the Michigan Press Association. She was also named a 2016 Fellow of the Loyola Law School, Los Angeles’s prestigious Journalist Law School. Anna Clark is a journalist living in Detroit. Her writing has appeared in ELLE, The New York Times, The New Republic, POLITICO, The Washington Post, The American Prospect, Next City, Grantland, and other publications. She was a media correspondent for the Columbia Journalism Review as part of its United States Project for nearly five years. Clark’s forthcoming book, The Poisoned City: Flint’s Water and the American Urban Tragedy, will be published in April 2018 by Metropolitan Books, an imprint of Henry Holt. Jack Cheng is a Shanghai-born, Michigan-bred, Detroit-based author. His debut middle grade novel, See You in The Cosmos, published in February 2017 by Dial Books for Young Readers, is a Junior Library Guild selection, Top 10 Indie Next Pick, and winner of the 2017 Great Lakes, Great Reads Award. It will be translated into more than 20 languages. Moderated by Jordan Works, editor-in-chief of The South End, Wayne State University ’19. Works is a junior double majoring in journalism and political science. She is a member of the Journalism Institute for Media Diversity (JIM).